IC 2118 is a reflection nebula in the constellation Eridanus. 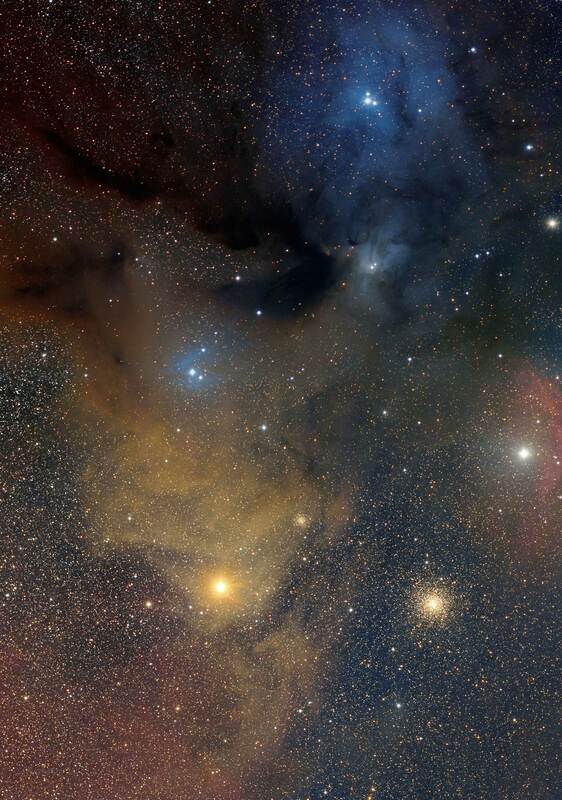 It is a dim dust cloud that is illuminated by the star Rigel in the constellation Orion. 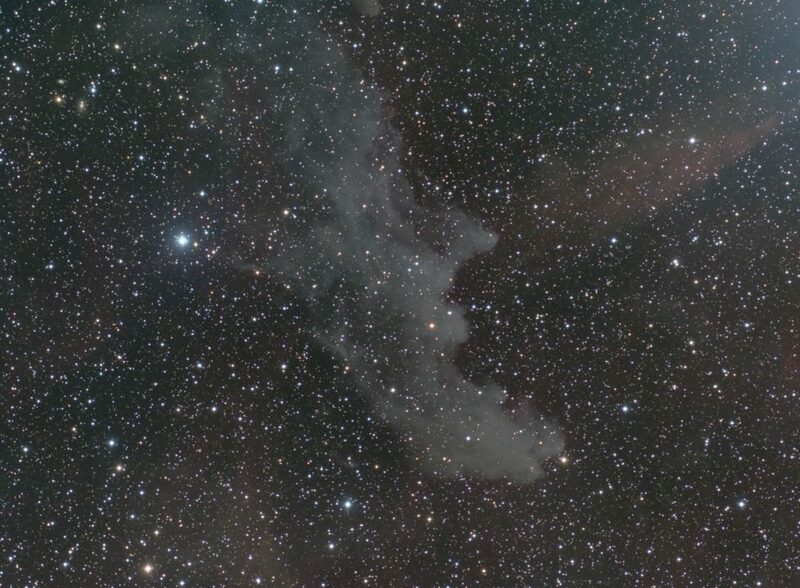 The entire dust cloud appears to be in the shape of a witch head and thus the nickname the Witch Head Nebula. IC 2118 gets its shape from stellar winds and this is confirmed by the same appearance in both Optical and InfraRed light. The distance is somewhat uncertain but if in the ~400 parsec range the stellar wind is likely from the trapezium region of Orion. If in the ~200 parsec range then the stellar wind is likely from the Orion-Eridanus super bubble. IC 2118 is also a star forming region. 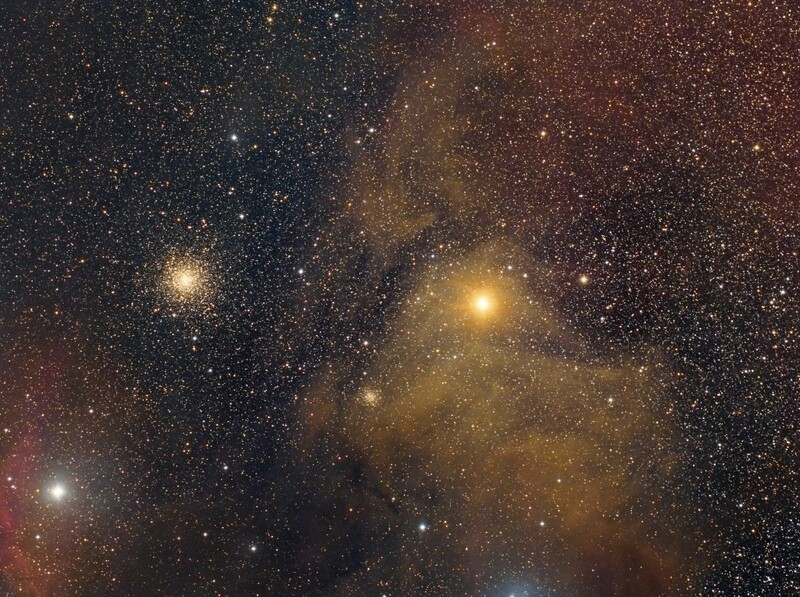 Stars can form from dust clouds by a few different methods. For IC 2118 it is thought that the same stellar wind that has shaped this region is also responsible for providing the motion needed to start the collapse and compression of the dust to form young stars. As of 2013, six YSO’s (young stellar objects) candidates have been discovered using IR cameras on the Spitzer telescope. An additional 9-11 candidates have been discovered by others. This image was captured at a dark sky site. The conditions were high humidity but no wind. I had to stop imaging at about 1am as the clouds and sprinkles rolled in. Thankfully I heard the raindrops right away (I was sleeping) and disaster was averted. IC 5146, better known as the Cocoon Nebula, is an open star cluster surrounded by a combination of emission and reflection nebula in the constellation Cygnus. The source of illumination for this nebula is a young type BO star listed as GSC 3608:1446 and is at the center of the nebula. Most sources state an age of 100,000 years for this star. There are several hundred young stars in this cluster that are about 1,000,000 years old. The difference in age would indicate different stages of star development continuing to the present day. The red regions are emission nebula illuminated primarily by the central star and consists of LBN 424, LDN 1055, and VdB 147. The darker regions around the nebula and extending away from the nebula are separate dark nebula named Barnard 168. Barnard 168 is the home to many star forming regions. Many of these regions are in various states of development and as of 2008 there were approximately 200 YSO (Young Stellar Objects) candidates. This count was taken from a paper called “The Spitzer Survey of Interstellar Clouds in the Gould Belt. I. IC 5146 Observed with IRAC and MIPS”. Barnard 168 contains several objects from the Lynd’s Dark Nebula catalog. These are listed as LDN 1020, LDN 1024, LDN 1030, LDN 1031, LDN 1035, LDN 1040, LDN 1042, LDN 1045, and LDN 1052. These all form the long tail seen trailing away from the nebula. As a side note, this image was taken from my house in an orange zone. I captured this object on September 13, 2015 and September 14, 2015 and the conditions were clear and dry. I managed to collect some nebulous regions to the bottom right of the frame but I am not sure what they are. 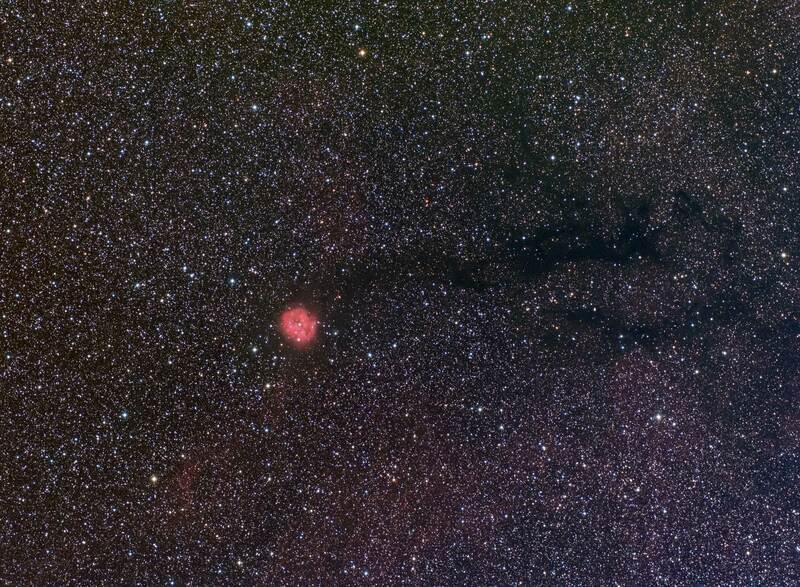 There is also a faint nebulous region just above the Cocoon Nebula but I could not identify what it is called. IC 348 is an open star cluster surrounded by two small reflection nebula LBN 758 and LBN 601. It is set in a region of both emission and dark nebula that makes for an interesting wide field image. 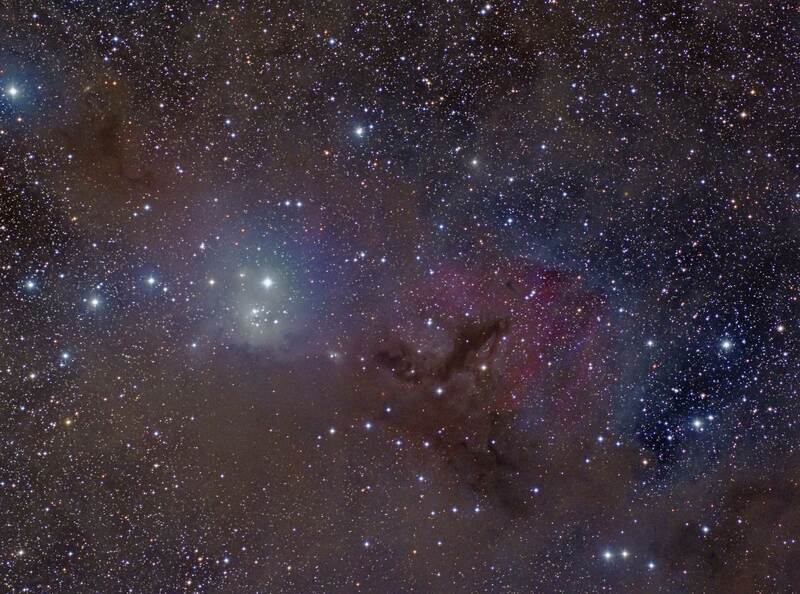 Between us and IC 348 are the Taurus and Perseus dark clouds and this provides some reddening of the field. The star cluster contains about 400 stars at an estimated age of 1.5 million years. The distance of 970 light years is based on three separate studies all results within a few light years of each other. My field of view shows several other objects in addition to IC 348. Several dark nebula are shown and they are listed in Lynd’s Catalog of Dark Nebula (LDN). LDN 1471 is in the upper left of my image. LDN 1468, LDN 1470, and LDN 1472 are just to the lower right of IC 348. B.T. Lynd’s also created a catalog of bright nebula called Lynd’s catalog of Bright Nebula (LBN). Also in my field of view is LBN 749 and it appears as the reddish emission nebula to the right of IC 348. This image was captured from a dark site on October 9, 2015. The conditions were clear and dry but there were passing high clouds all night. The field of view for this image is 3.6 x 2.8 degrees. IC 4603 (LBN 1109) (VdB 105) is a reflection nebula that also shows partially as an emission nebula. The central star is SAO 184376 which is the illumination source of the area. IC 4604 (LBN 1111) (VdB 106) is a reflection nebula with three stars at its center. IC 4606 (LBN 1107) is an emission nebula partially illuminated by Antares. It is yellow in color and really stands out from the much bluer IC 4603, IC 4604, and IC 4605. Messier 4 (NGC 6121) is a class IX globular cluster and at a distance of 7000 light years it is one of the closest globular clusters. It contains several thousand stars and to date 43 are variable stars. Estimated age is 12 billion years. NGC 6144 is a class XI globular cluster at a distance of 29,000 light years. SH-9 is an emission nebula that is illuminated by the star Sigma Scorpii. B42 and B45 separate the reflection nebula IC4603 and IC 4604. 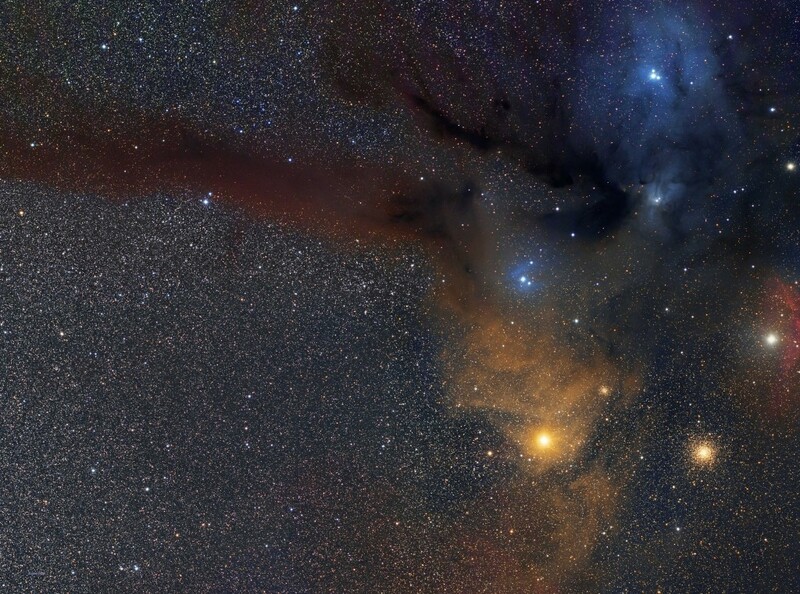 B44 is a large dark nebula that spans 10 degrees from the Rho Ophiuchi complex t the Pipe Nebula. This image was captured in two nights from a dark site. The conditions were very good with no wind and a humidity of 50%. The target is low from 34 degrees latitude so I was imaging through lots of atmosphere. There were some extreme gradients to deal with due to the altitude of the target and also the large area of the area of the sky involved. I was very pleased to capture this object as it has been on my target list for a couple years. I used a total of four images to create this mosaic. Each image is 3.67 x 2.87 degrees so the mosaic covers about 7 x 5 degrees it total. This is my image of the area around Messier 8 and Messier 20 located in the constellation Sagittarius. 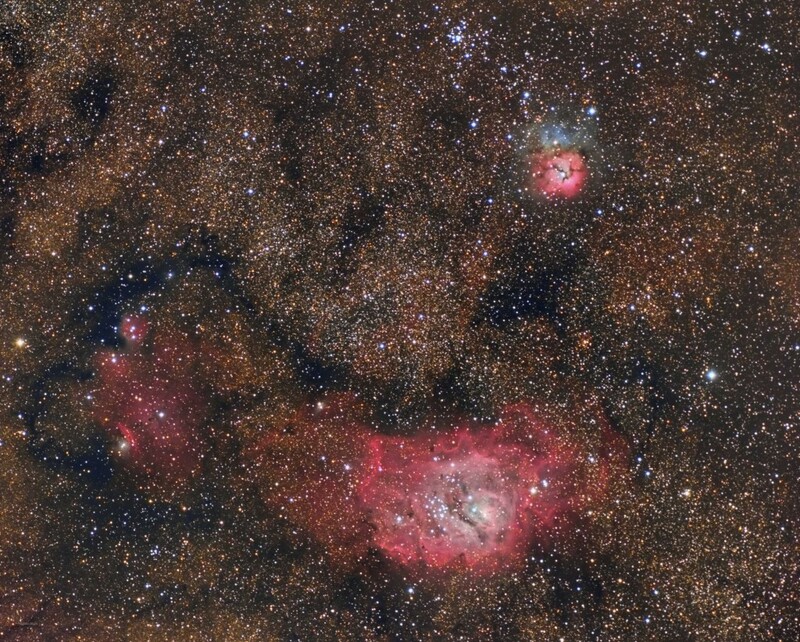 While M8 and M20 are the primary objects in this field there are also several IC and NGC catalog objects plus Messier 21 that are shown in this field of view. Messier 8, also listed as NGC 6523, is a large emission nebula. It is an active star forming region about 5,000 light years away. The size of the nebula is about 90 x 40 arc minutes or about 140 x 60 light years across. There are several Bok globules in the nebula and three are listed in Barnard’s catalog. Barnard 88 is the comet shaped globule that runs from North to south. Barnard 89 is the globule that is in the center of M8 next to the open cluster NGC 6530. B296 is a long thin globule to the left of the center star cluster. NGC 6530 is the open cluster that is at the core of Messier 8. This is a young star cluster with an age of about 2 million years and is populated by very hot young stars. This cluster is thought to be in front of M8 as there is not a lot of reddening from the gas and dust of M8. Messier 20, also listed as NGC 6514, is a combination of emission, reflection, and dark nebula. It is about 5,000 light years away and contains regions of active star formation. M20 is about 28 arc minutes in diameter or about 42 light years across. M20 basically consists of three separate sections divided by a dark nebula cataloged as Barnard 85. Messier 21 is an open star cluster at the top of my image. It is about 4,250 light years away and it is about 13 arc minutes across. The age of the cluster is about 4.6 million years and contains less than 100 stars. IC 1274 is a faint circular nebula and contains a small star cluster at its center. This cluster is the source of illumination for the nebula. The cluster is about a million years old. IC 1275 is another faint circular nebula just below IC 1274. It has less structure that IC1274. 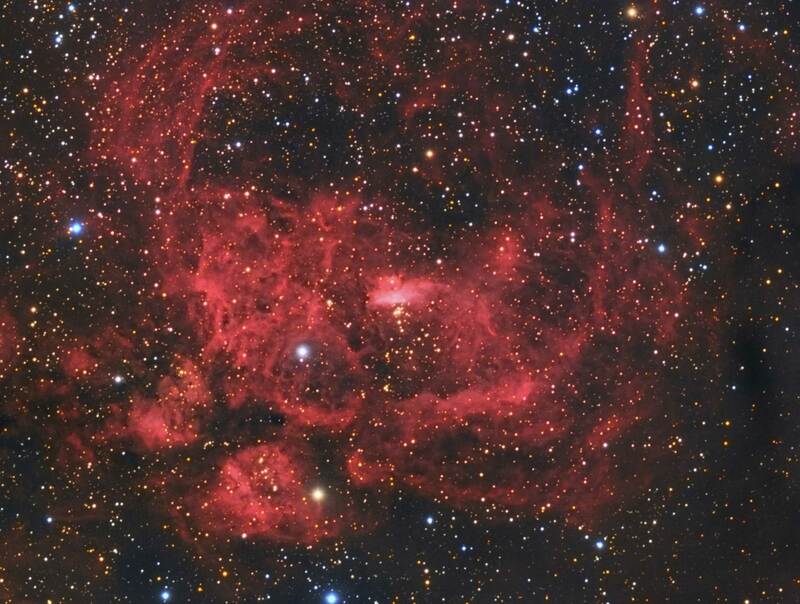 IC 4678 is a very dim nebula and it is located just above and to the left of Messier 8. It appears as a white smudge with some small reddish filaments. IC 4681 is a very small reflection nebula just above IC 1274/1275. It appears as a bluish smudge surrounding a small star. IC 4684 is located very close to IC 4681 and it appears as a bluish smudge surrounding a small star. IC 4685 is a small emission nebula just below IC 1274/1275. This image was captured from a dark site in one night. The conditions were excellent with 30% humidity and no wind. I framed the image to get all of the above objects in one frame. I went back and forth on whether to rotate the camera 90 degrees to get a different field. The area is so rich in targets I don’t think I could have gone wrong either way. Barnard 59, commonly called the Pipe Nebula, is a large dusty region in the constellation Ophiuchus. The Pipe Nebula consists of three main parts; Barnard 59, Barnard 65-67 (the stem), and LDN 1773 with Barnard 78 (the pipe bowl). In addition to the Pipe nebula, there are Barnard 72, 77, 262, and 272 which form the “smoke” of the pipe nebula. 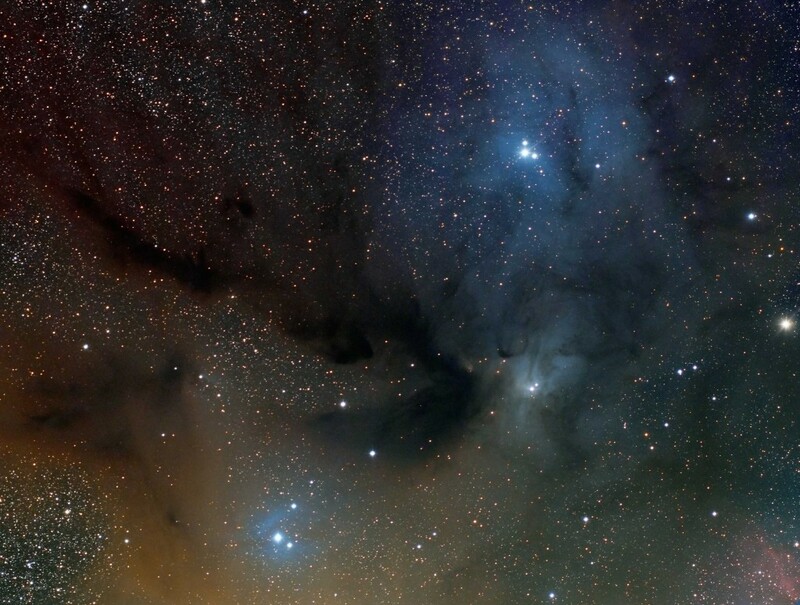 Most of the Pipe Nebula consists of very cold dust with no star formation. This is unusual when compared to other dusty regions of the Gould Belt. Barnard 59 is the only part of the nebula that shows any star formation. Gravitational interactions and magnetic interactions are two theories behind the filament formation that houses the star formation in Barnard 59. My image only contains the pipe bowl section which consists of LDN 1773 and Barnard 78. My field of view in this image is 3.67 x 2.87 degrees which is large but not large enough to capture the entire Pipe Nebula. This image was captured at a dark site but with very poor conditions. I began imaging just after 9:00PM but the fog rolled in around 11:00PM. The humidity was very high and condensation quickly formed on my laptop table. Barnard 72, commonly known as the Snake Nebula, is a dusty region in the constellation Ophiuchus. 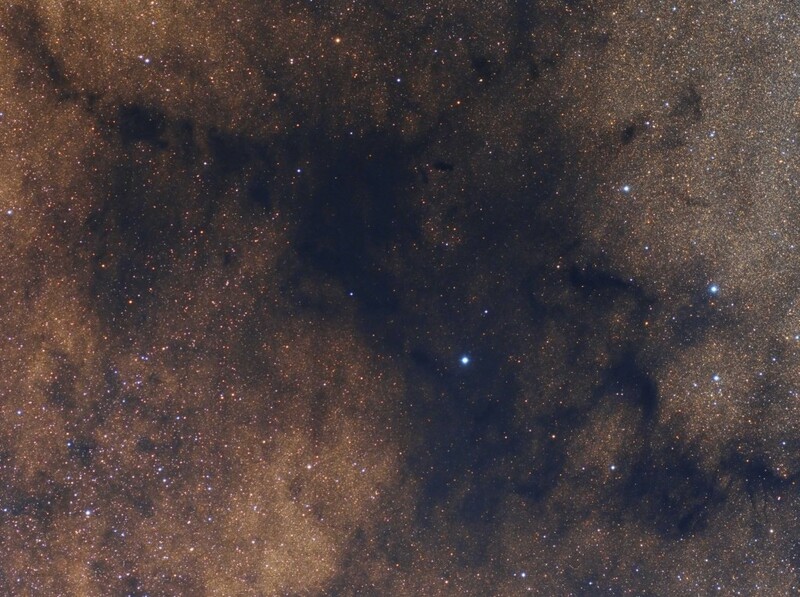 This dark nebula is set against the bright and colorful star field of our Milky Way galaxy. Dark nebula often house regions of star formation and Barnard 72 is one of these regions. The Spitzer and Herschel space telescopes have identified two regions noted as P1 and P6 that contain 23 cosmic seeds that will eventually form in to stars. These seeds have been measured and their masses vary between 5-25 times the mass of our Sun. To attach a diameter to this mass, these seeds span a distance of several hundred billion kilometers. For comparison the distance from the Sun to Earth is 150 million kilometers. 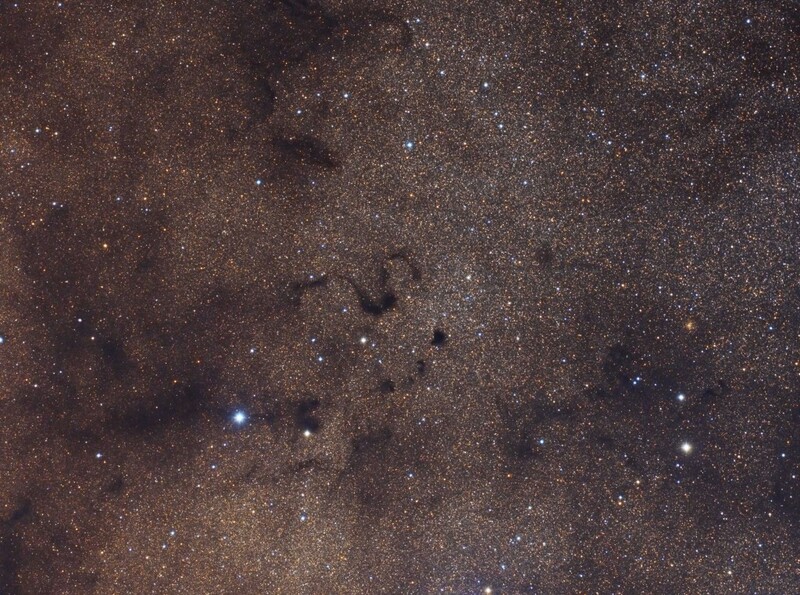 There are several other dark nebula in my field of view with Barnard 68, 69, 70, 74 to the bottom right. The Snake Nebula is part of a larger dusty region called the Dark Horse Nebula. I could not find any other sources to identify the other dark regions in this field of view. On the right side of my image is globular cluster NGC 6325. This image was captured from a dark site under very poor conditions. I started imaging at 9:15PM and it completely fogged over at 11:15PM. The humidity was very high and my small laptop table was very wet. However, I thought this image was a keeper. NGC 6357, also known as the War and Peace nebula, is an emission nebula in the constellation Scorpius. It is also known as the Lobster nebula and I personally think this is the best description. As with all emission nebula NGC 6357 is home to many young hot stars. It is also home to three large star clusters with Pismis 24 being the largest containing about 800 stars at an age of 1-3 million years. NGC 6357 is illuminated by several large young stars. These stars are also responsible for carving out the many shapes seen throughout the nebula. Most of these shapes appear as knotty or wispy structures but there are also a few elephant trunk structures in the nebula which are thought to contain star forming regions. This image was captured in one night under good conditions with no wind and about 50% humidity. I am at 34 degrees latitude so this target was really low in the South and I was very excited to be able to capture it. I have had it on my to-do list for three years now and I can finally mark it as done. Messier 27 is a large planetary nebula in the constellation Vulpecula. At a size of 4.5 light years across it is a little wider than the distance from our sun to our nearest star. 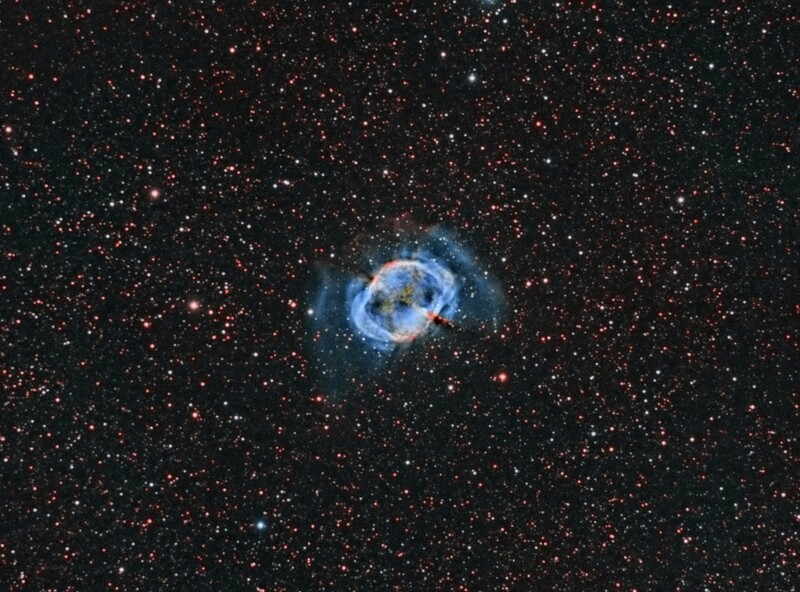 M27 was the first Planetary nebula discovered in 1764 and since then nearly 3000 have been cataloged. The central star of M27 is in the process of dying and as a result has lost most of its outer layers to the stellar medium. What is left is a dwarf star that is very hot and illuminating the ejected gas as it is moving away from the area. Measurements of the expansion rate of the outer layers varies, some have a rate as large as 6.8 arc second per century while others show 1 arc seconds per century. This difference effects the estimated age of the nebula, from as young as 3,000 years to as old as 48,000 years. Planetary nebula are formed from stars with solar masses of 1-8 times that of our sun. This is really a dying star that is too small to go supernova. Its death spiral begins with a shedding of outer layers that are ejected from the surface. This shedding of gas is the result of gravity overpowering the internal pressure created by fusion. As the star exhausts its hydrogen it is forced to use other elements until this higher pressure can no longer be maintained. At this point the star begins to shed its outer layers while the remaining layers start to collapse causing the core to heat up. The central star can have a surface temperature of 20,000K to 250,000K and it is this extreme ultraviolet radiation that ejects the outer layers, shapes them, and illuminates them. Planetary nebula are great objects for studying how stars such as own will end. In addition, the ejected gasses can be studied for their chemical composition. Furthermore, elements in the gasses are now available for use by the galaxy in future star or planetary formation. This image was captured from my house in a Bortle 6 zone. 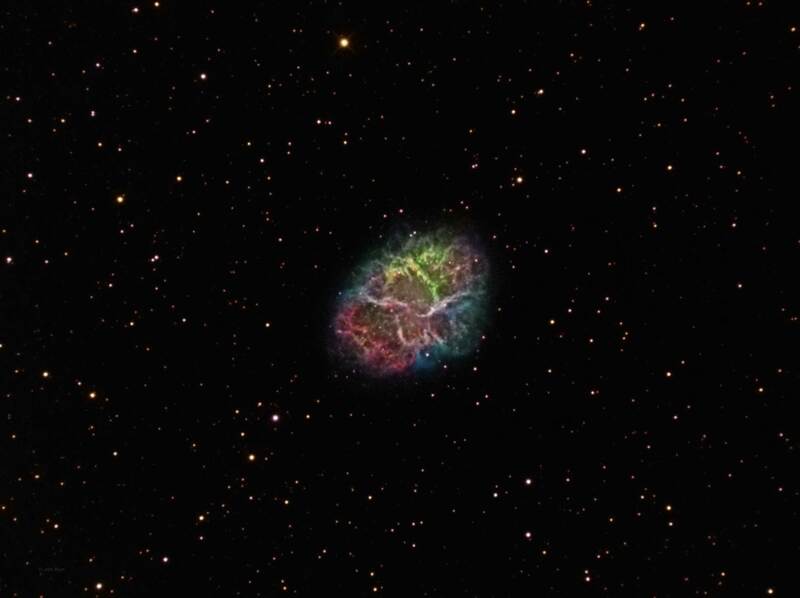 Messier 1, also known as the Crab Nebula, is a supernova remnant in the constellation Taurus. A supernova remnant is what is left after a star explodes. The first record of it was on July 4, 1054 by Chinese astronomers. At that time it appeared to the naked eye about 4x brighter than Venus plus was visible for the first 23 days and 653 nights. M1 is expanding in all directions at a very fast rate of 1,800 km/second. It is expanding fast enough to see visible changes in images captured a decade apart. The brightest areas of the Crab Nebula are filaments that consist of the outer layers of the former star. The progenitor star, which is the star that caused the supernova, is thought to have been between 9-11 solar masses in size. Of course this is an estimate but typically stars less than 8 solar masses produce Type Ia supernova that later take shape as planetary nebula. Supernova from stars with over 12 solar masses do not have the same chemical composition as M1. Messier 1 is a Type II supernova which is the result of a massive star collapsing upon itself and then exploding. The progenitor star of M1 is now a pulsar that rotates at 30 times per second emitting massive amounts of energy in all electromagnetic spectrum. It is this massive amount of energy that is producing the fast rate of expansion. This image was captured from my house in a Bortle 6 zone. The conditions were not ideal as the humidity was in the 80-90% range with some passing Cirrus clouds but there was no wind. I really wanted to get this target with a long focal length scope. It has been on my to do list for three years now and I want to try it again next year in LRGB from a dark site.